Some say it was a German who invented the automobile, but we Oppos know it was really a Frenchman. 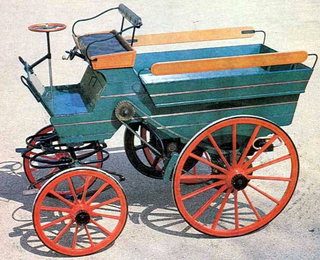 Whether you credit Cugnot’s 1769 self-propelled barge, Lenoir’s Hippomobile, or this, Édouard Delamare-Deboutteville’s 1884 gas powered buggy, it was the French. And, this one had a proper steering wheel and 4 wheels even, so it was much more a car than Benz’s trike. Actually, looking at it, I think Ed also invented the pickup. It used a four-stroke engine running on gas oil and drove 3.6 miles in February, 1884. And, starting a tradition for French cars, it was terribly unreliable. Delamare-Deboutteville apparently built several vehicles some of which reportedly exploded. But, hey, nearly 150 years later that still happens to new cars.